Today is my seventieth birthday. I’m very grateful that I’m in very good health with no sign of cancer nearly sixteen years after my diagnosis. I’m grateful also for my family – Ken, my beloved husband, and my wonderful daughters, Margie and Sarah Klein, and soon-to-be son-in-law, Jeremy Ronkin – and for family and friends. Because of my work with Kulanu, I have friends all over the world, especially in Jewish communities in Africa. 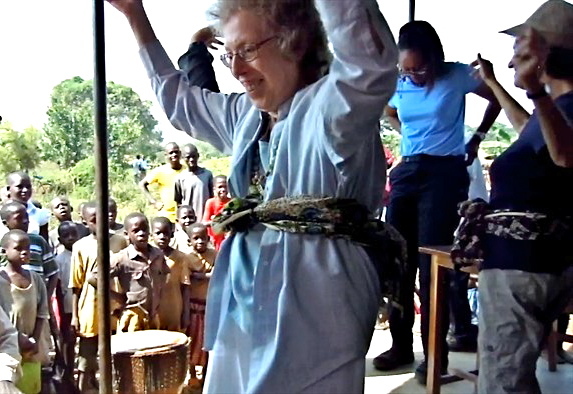 Here’s a photo of me dancing in Uganda in the Abayudaya village, Namutumba, to celebrate their new grain mill that Kulanu funded. In addition to my work with Kulanu, my life is enriched by my synagogue, West End Synagogue in New York, and by my dancing (which you can read about here). A special thanks to those of you who supported me through the challenging time when I was in cancer treatment, back in 1997 and 1998. And I hope it gives hope to others to know that some of us with a scary prognosis can survive cancer for many years in good health! referral to have my surgeon double-check it. I made an appointment with Dr.
serious). I stayed fairly calm until the night before the appointment. Dr.
my oncologist, oncological gynecologist, and radiologist – in the interim). Provider deleted their account and wiped out their Web site. >week of daily updates and blood count information. >some of our family as I write this), and she has plans for the summer. again. Please join me in praying for her. and they urged me to share this with the rest of you. cancer, and my blood counts are continuing to improve, and I’m feeling fine. that the results seem favorable. weeks after the last platelet transfusion. to her. When we finally got back (by bus and then taxi), Sarah was fine. is planning program on stories and storytelling for our synagogue retreat. to do some kind of community service work in India this summer.